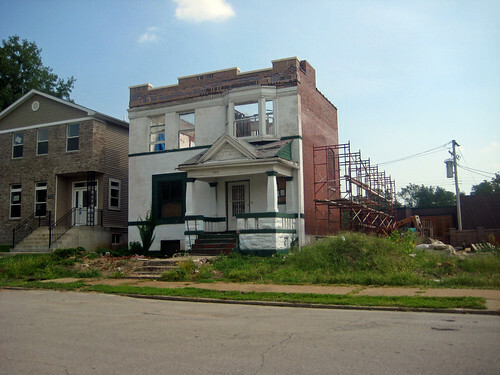 Last month I did a post showing some major alterations going on at 4604 Washington, a circa 1900 owned by Bowood Farms. The roof and back half of the house were gone and it was somewhat unclear what was happening. Bowood had previously completely demolished a similar house next door to the west at 4608 Washington, which did not exactly give me confidence about what could be going on currently. Michael Allen posted a comment that Bowood was trying to save part of the house, and it is now clear that this is indeed the case. The front half of the house remains, and a new parapet wall has been constructed at top of the front elevation where the former sloped roof containing a partial third floor was removed. A new flat roof will likely be built behind the parapet as well as a new rear wall to enclose the remaining portion of the building. A streescape view shows a new wood structure that has been added to the east side of the existing former auto repair shop at 4612 Washington. The east edge of this new structure partially rests on the remaining foundation of the demolished house at 4608 Washington. A close-up of the new parapet with limestone cap. The variation in brick used in the new parapet is an indication that the front of the house will remain painted. 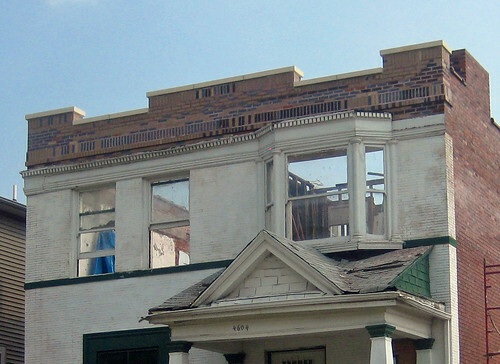 This photo from April 2009 during the demolition of 4608 Washington shows the former shape of the roof at 4604. The demolition of 4608 was unfortunate, losing all of the house next door would have been awful for the streetscape of an already tattered block. Is it possible that a flurry of bad press last year about the demolition above and one across the street had some influence on Bowood's decision to preserve part of 4604 Washington? Partially infilling the space left behind with the new structure will help this stretch of washington maintain some continuity. 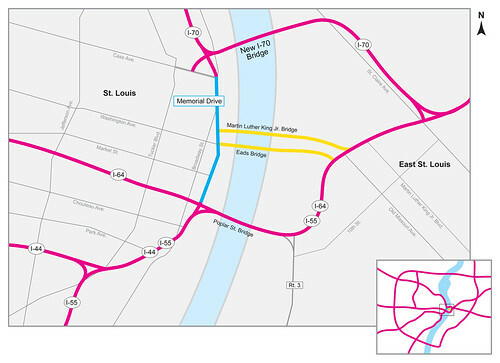 In february 2014, Interstate 70 will be officially be removed from Downtown St. Louis. Yes thats right, I-70 will be GONE south of Cass Avenue once the New I-70 Bridge across the Mississippi is complete just north of Downtown. The map from City to River above shows how Interstate 70 will be diverted across the new dedicated bridge into Illinois. What will be left will be an orphaned stretch of highway along the route shown in blue. Construction of the new bridge is not new news, but at the City to River event Wednesday night at the Tap Room, I was surprised to learn how many people do not realize what this does. The new I-70 bridge is not simply a reliever for the interstate, it is a total relocation of Interstate 70. This relocation makes possible the removal of the stretch of highway between Cass Avenue to the Poplar Street Bridge because this orphaned and aging infrastructure will become redundant. Replacement of the elevated and depressed lanes highway with an at-grade boulevard transforms a significant barrier into a great connector. As you are likely aware, on Tuesday the proposals of the five finalists in the City+Arch+River Design Competition were revealed. Four out of five of the design teams call for removing the elevated and depressed lanes of what will be the former I-70 as the ultimate solution to reconnecting Downtown St. Louis with the Arch and riverfront! The public has only one week, ending Monday the 23rd to submit formal comments to the competition jury before they begin their deliberations to choose the winner. Please go to the official Competition Comment Form today and let the jury know that they should select a winning entry that supports reconnection by removing the highway and replacing it with a pedestrian friendly boulevard. 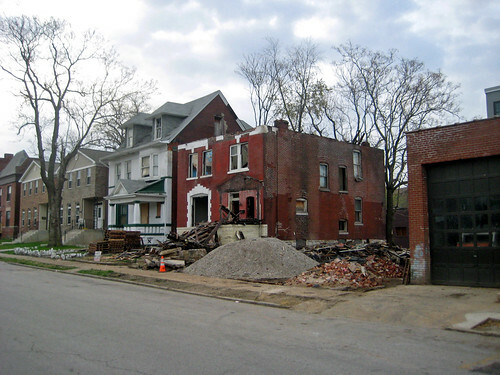 My last post began with one of the most depressing photos of St. Louis that I know. Today. I leave you with one from a year later on March 9th, 1965 from a recently posted Post Dispatch gallery called "The Arch as Art". It reflects the unbounded optimism for the future that was shared by St. Louis and the nation at that time. I share that optimism now that St. Louis can overcome the planning mistakes of the past, reconnect to its river birthplace and reopen the front door of the City for next millennium. I hope you do too. I still find this photograph one of the most depressing images of St. Louis. Our beloved stainless steel monument to westward expansion is not even halfway complete, and it is already being cut off from the City. Since it was built, the Gateway Arch and surrounding park have stood on an island surrounded by tangles of infrastructure. 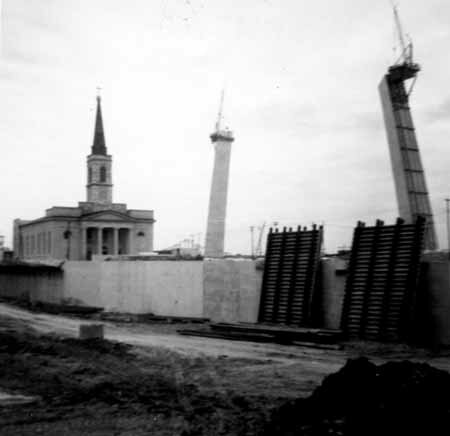 St. Louis' front door was closed before it was ever finished. However, with the convergence of two events: the construction of the new Mississippi River bridge which will carry I-70 across to Illinois north of Downtown and concurrent The City+The Arch+The RIver Design Competition, the opportunity exists to reopen our front door and re-connect St. Louis to the Arch, the riverfront neighborhoods north and south and to its birthplace, the river itself. Next Tuesday the 17th, at 8:00 am, the designs of the 5 competition finalists will be unveiled to the public. For ONE WEEK only, the public will be able to submit comments about the designs that will be given to the competition jury for consideration as they select the winning team. The following night, City to River will be hosting an event at the Schlafly Tap Room. We will have visuals of the finalists designs available as well as laptops so you can make your comments directly on the competition website. Comment cards will also be available that will be delivered to the competition exhibit at the Arch. 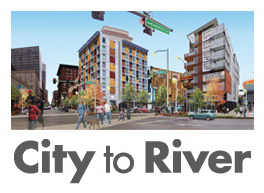 City to River will be encouraging everyone to comment favorably toward design proposals that call for highway removal and replacement with a boulevard. City to River feels that replacing the soon to be defunct section of I-70 from the PSB to Cass Avenue is the only way to truly re-connect St. Louis to its riverfront. 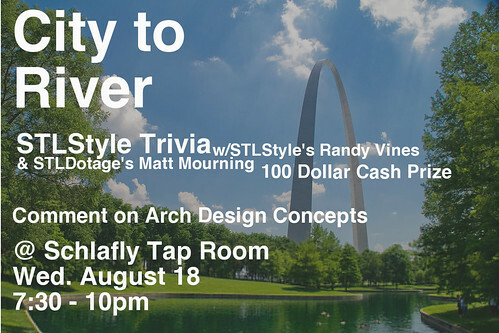 The event will also feature St. Louis trivia to make for a complete evening of fun! We have a Facebook event and encourage you to RSVP and share the invitation with all your friends. If you cannot attend, please visit the The City+The Arch+The River Design Competition website, take a look at the designs and leave some comments. You can also see the designs in person and fill out a comment card in the underground lobby of the Gateway Arch daily from 8:00 am to 10:00 pm. Remember that public comments to the jury are only being taken through Monday, August 23rd. This is your chance to make a real difference in the future of St. Louis for the next 50 to 100 years! Please take time to participate. 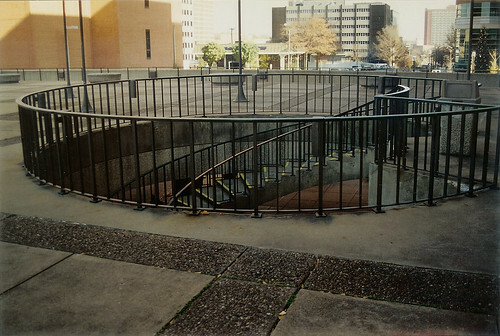 This elegant floating helical stair was located near the entrance to the Courts Building of the St. Louis County Government Center in Clayton. 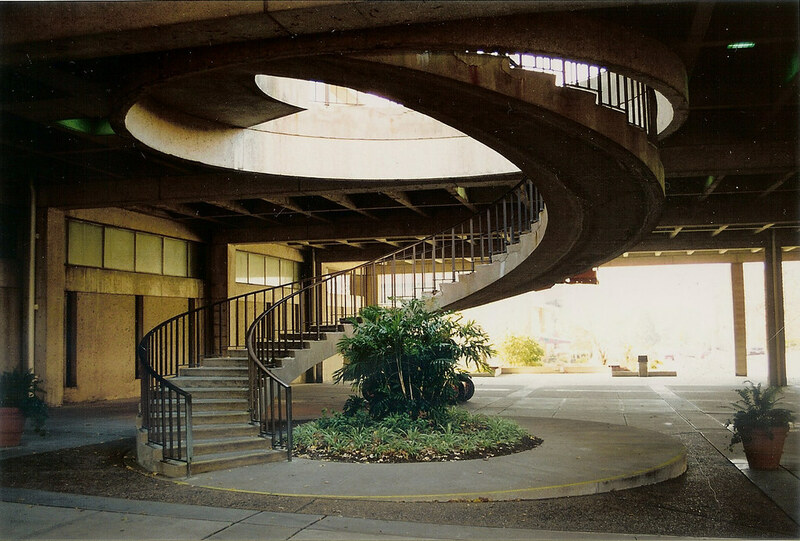 It was completed in 1972 and was probably the only redeeming element of the brutalist styled complex consisting of the County Administration Building, the Courts Building and a large elevated plaza that had been designed by Murphy, Downey, Wofford & Richman in 1968. 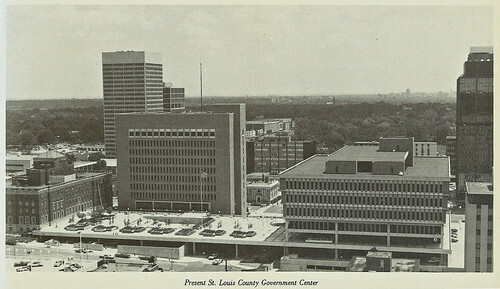 The elevated plaza spanned across Carondelet Avenue connecting the new Courts Building with the St. Louis County Police Headquarters building on Forsyth by Preston Bradshaw that had been completed in 1950. The original county courthouse dating from 1877 was demolished just prior to construction of the new complex. Although the helical stair was elegant, its surroundings were bleak at best. Much like the space underneath the elevated lanes of Interstate 70 that divide Downtown from Laclede's Landing, the underside if the plaza resembled the lowest depths of a parking garage. No amount of lighting or decoration could improve the cavern-like space. Driving on Carondelet Avenue was like going through a tunnel. Both the County Administration Building and the Courts Building greet the surrounding streets of Clayton with blank walls. At the top of the staircase, conditions were not much better. The plaza level was isolated and typically barren and lifeless except for the occasional smokers venturing out of the surrounding buildings. I was always amused and somewhat bewildered that St. Louis County would set up its Christmas tree on the elevated plaza directly over the street below. A 1976 aerial view of the elevated plaza and government buildings from the book Clayton: A History. 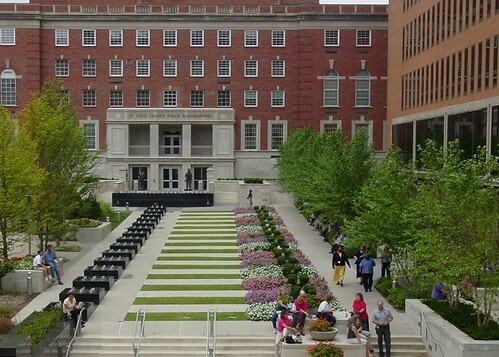 Fortunately in 2000 the elevated plaza, which had been steadily deteriorating, was demolished and replaced with an attractive at-grade park and plaza space designed by HOK as a memorial to police and firefighters that have died in the line of duty (photo from St. Louis County's website). Unfortunately, Carondelet Avenue was closed and removed between Meramec and Central as part of the process. The elegant floating helical stair also met its demise and was replaced with a very plan switch-back stair to 2nd level entrance of the Courts Building. 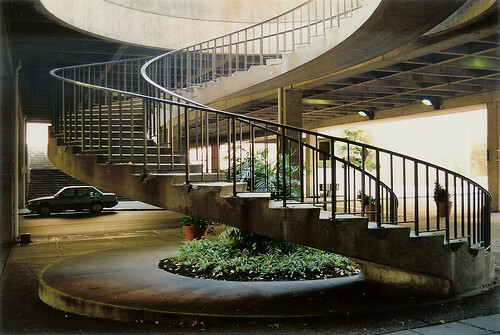 Elevated plazas were a favorite scheme of modern-era planners and architects who used them liberally government centers, civic spaces, and urban renewal projects such as the Mansion House complex which was begun in 1962. A plaza at the second level connects the various buildings of the complex and is almost always devoid of life or activity. 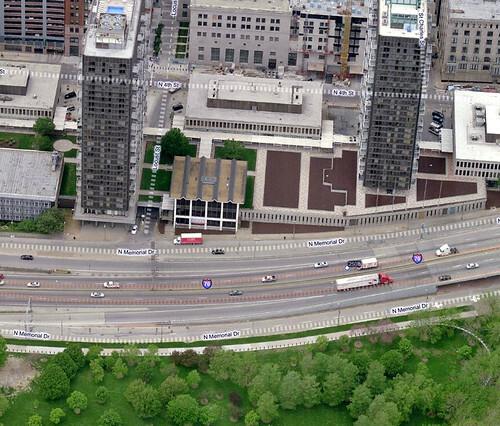 That there is an interstate highway just to the east separating the complex from the Arch grounds and creating an endless deafening roar at the plaza level could be a partial explanation for its failure, but generally, the fact that the elevated spaces are sequestered from street level activity dooms them to desolation. 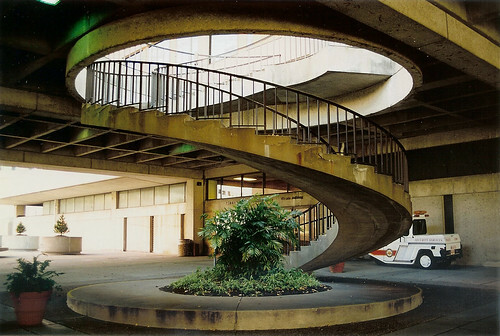 In the 1960's a series of elevated plazas was considered for completing the final blocks of the Gateway Mall east of the Civil Courts Building. Fortunately this plan never left the drawing board. Amazingly however almost 50 years later, some are calling for raising the level of Luther Ely Smith Park east of 4th street and building a block wide plaza or bridge to connect to the Arch grounds across Memorial Drive and the interstate below. While not elevated on the east and west ends, this block would have similar isolation issues shared by the urban planning disasters of the 1960's due to the fact that this new plaza or park space would disconnected from its surroundings to the north and south. Worse though would be the dark dreary tunnel like space created underneath the bridging plaza just like what existed at the County Government Center. As has been clearly pointed out by City to River, the cost associated with adding another layer of infrastructure to the problem of connecting Downtown to the Arch grounds far outweigh the benefits. Spending large sums of money on a new block-wide bridge that would be a maintenance issue in the future and only connect one block of Downtown to the Arch just doesn't make sense. What makes sense is removing the deteriorating infrastructure that is the soon to be former I-70 and replacing it with an urban boulevard which would provide restored connections along its entire 1.4 mile length.